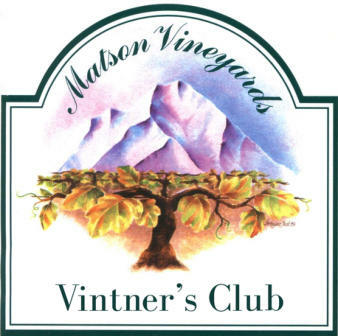 Visit Matson Vineyards Wine tasting activities and tours by appointment. Wine tastings during business hours with same day appointments available (no appointment needed if you are a Wine Club member). Call us at (530)222-2833 or (530)949-4421 We look forward to your visit. Directions In Redding, from Highway I-5 take Highway 44 east (toward Lassen Park) to the Shasta View exit. Turn left onto Shasta View and continue to the stop sign at Old Alturas Rd. Turn right, continue to the flashing red light at the intersection of Old Alturas and Old Oregon Trail, and continue straight for about 0.7 miles. Turn left on Arapaho Dr., just before the bridge over Salmon Creek, and continue for about 1/4 mile. Take the first driveway to the left and go up the hill to Matson Vineyards. Soon, you should be greeted by our very friendly winery dog, Muddy. Visit Matson Vineyards Wine tasting activities and tours by appointment. Wine tastings during business hours with same day appointments available (no appointment needed if you are a Wine Club member). Call us at (530)222-2833 or (530)949- 4421 We look forward to your visit. Address: 10584 Arapaho Dr. Redding, CA 96003 Phone: Winery Line: (530)222-2833 Lynette Shaw: (530)949-4421 E-mail: Lynette Shaw (Tasting Room and Wine Club): lynette@matsonvineyards.com Roger Matson (Owner/Winemaker): matsonvineyards@sbcglobal.net Directions In Redding, from Highway I-5 take Highway 44 east (toward Lassen Park) to the Shasta View exit. Turn left onto Shasta View and continue to the stop sign at Old Alturas Rd. Turn right, continue to the flashing red light at the intersection of Old Alturas and Old Oregon Trail, and continue straight for about 0.7 miles. Turn left on Arapaho Dr., just before the bridge over Salmon Creek, and continue for about 1/4 mile. Take the first driveway to the left and go up the hill to Matson Vineyards. Soon, you should be greeted by our very friendly winery dog, Muddy.